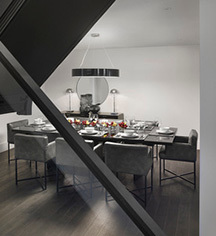 a.lounge is a breathtaking bi-level penthouse amenity space created by renowned international designer and architect Piero Lissoni for residents to enjoy and unwind. 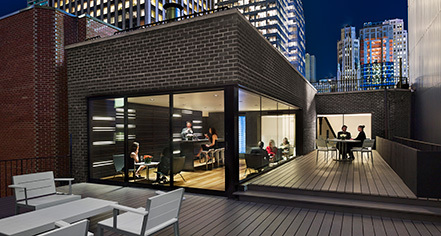 The space features a.13, an intimate bar with floor-to-ceiling windows, stunning views of Times Square, and an expansive roof deck with lounge areas. For convenient, yet desirable, New York City dining, AKA Times Square is adjacent to two restaurants, Cafe Un Deux Trois and Hunt & Fish Club. Cafe Un Deux Trois is a bistro-style venue that serves French cuisine for breakfast, brunch, lunch, and dinner service. Hunt & Fish Club is an upscale steak house serving a classic yet contemporary menu featuring exceptional steaks, game, seafood, and delectable cocktails for lunch and dinner.